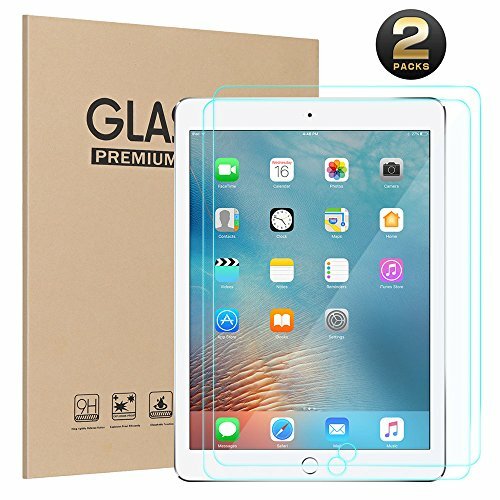 Ztotop Tempered Glass Screen Protector for New iPad 9.7" (2018 & 2017) / iPad Pro 9.7 / iPad Air 2 / iPad Air. 9H harness tempered glass, can effectively protect your iPad screen again scratches by keys or other hard items. 99% high definition clarity and light transmittance keep original and stunning viewing quality and experience. Enjoy you games and videos. The tip of the pencil was completely attached to the iPad screen. Followed by the instructions,Just slide your finger across the glass, and it will adhere to the screen itself. No bubble. 2-Pack tempered glass screen protector, packing will hold device firm and stable.don't worry about the broken glass,100% customer satisfaction gauaranteed, 24 hrs email support. [Compatibility]: For the New iPad 9.7" (2018 & 2017 Release) / iPad Pro 9.7-inch / iPad Air 2 / iPad Air. NOT FIT for iPad Pro 10.5 inch / iPad Pro 12.9 inch / iPad 2 / iPad 3 / iPad 4 and any other model. [Scratch Protection]: Premium tempered glass with industry-high 9H hardness rating effectively protects your iPad against scratches. [HD eye protection]:0.3mm thickness and oleophobic coating preserve your iPad Pro's, bringing immersive experience.,high-transparency and high touch sensitivity,dust and fingerprint protection. [Easy Installation]:Easy to Install, Zero-Bubble Guaranteed.Simply align the protector with your device and a simple swipe of your finger adheres the protector to your screen. [Lifetime warranty]:2-Pack tempered glass screen protector, packing will hold device firm and stable.,100% customer satisfaction gauaranteed, 24 hrs email support.